Today I volunteered to make dinner for 35 people. My daughter is performing in a play at her school this week. It is a Glamrock Twelfth Night by Shakespeare with David Bowie songs. The upper school's illustrious Theatre Director Margie's amazing idea. The rehearsals run late in the beginning of this week so dinner is necessary. The performances start Thursday evening. It is early in the morning and I am busy pondering what to make for their dinner. Healthy, delicious, something high schoolers would like, not too fattening , some are vegefruitiens.....gotta come up with something great for these amazing kids and their equally amazing faculty mentors... they all work so hard and do an incredible job! Wonder how this will evolve this time? So I decided to make French lentils. Saffron brown rice, roasted red peppers, carrots and potatoes, salad with balsamic vinaigrette and my lemon pound cake. Hope they like it! My daughter gave a full report... They all loved everything! Whew, I had a tough audience. I am delighted! I decided the lemon cake would be a nice recipe to blog about. This is actually the same lemon cake I made a while back when I made cakes and tartes for the farmer's market in Martha's Vineyard. I had a terrific following! Here is the recipe. I have a Beaterblade attachment for my Kitchen Aid and it is a terrific tool. It makes it possible to mix cakes without having to scrape the bowl. I love this thing! Preheat the oven to 350 degrees. Butter and flour one high 8" cake pan or two 5" x 9" loaf pans. In an electric mixer, with the paddle attachment cream the softened butter with the sugar and beat about 1-2 minutes on medium speed until the mixture is light and pale in color. Add the eggs one at a time. Combine the 1/2 cup sugar and 1/2 cup water in a small sauce pan. Bring to a boil, remove from the heat and add the zest from 1 lemon. Sift together the baking powder, salt and flour. Add the vanilla to the buttermilk. Add 1/3 of the sifted flour mixture alternating 1/3 of the buttermilk to the butter sugar and egg mixture until all the parts are combined. Then add the juice of 1 lemon. Scrape the batter into the prepared pan and bake for 35-45 minutes until it is golden brown in color and the edges of the cake have pulled away from the sides of the pan and the top is firm when it is touched and does not indent. Add the juice of 1 lemon to the to the lemon zest syrup once it has cooled. Let the cake cool for 15 minutes. Unmold and place on the rack. Spoon the syrup on both sides of the cake while it is still warm. Place on an attractive serving platter . Slice and serve when completely cool. This is the recipe, 2x. Saturday I made a fruit jumble for my friend who is recouperating from surgery. She titled it. It is composed of dried Turkish apricots, dried pitted organic plums and Hunza raisins... they are a beautiful green, very dense, sweet and quite dry. They happen to be my favorite raisins. They are grown organically in the Himalayas. This jumble is a delicious accompaniment to Greek yogurt or vanilla ice cream if you dare! Place all of the ingredients if using vanilla bean into a 3-4 quart sauce pan. If you are using vanilla extract don't include until the jumble cools, stir gently with a large spoon. Bring quickly to a boil . Then cover and lower the heat to simmer. Cook, stirring occasionally about 1 to 1 1/2 hours until the fruit is tender, but not falling apart, and the liquid is syrupy. Serve warm with yogurt or vanilla ice cream. On Sunday my daughter and I were looking at Vogue together and came across this amazing watch... She was so taken with it and so was I so I decided to take some photos. Here are some of the shots I got! 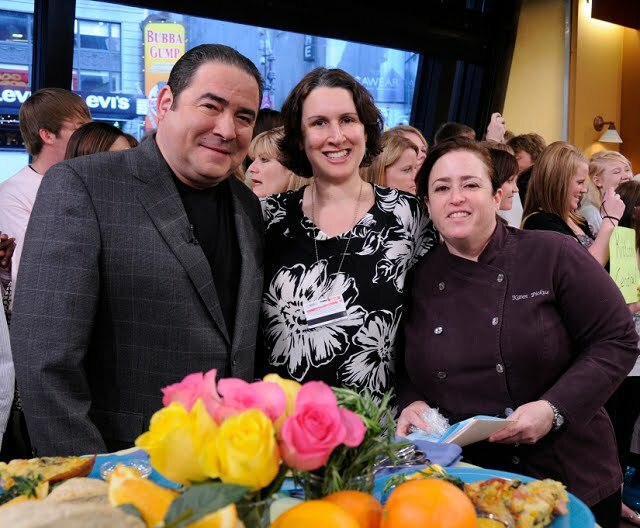 Margo, now Sr. Broadcast Producer, Me, Chef/Food Stylist, Maria, Food Segment Producer, Sara Celebrity Chef. Eddie our illustrious stage manager took this shot. Thanks Eddie! Sara Moulton was in today to celebrate her new book. Sara and I go way back... a long time ago me met when I applied for a job at La Tulipe restaurant in Greenwich Village. I knocked at the steel gate of the restaurant and this bubbly blond answered the door. She was so amused by my friendly handshake when we first met that fateful day on the steps of La Tulipe and became fast friends ever since. We worked together there as "mighty mights" her husband Bill would call us. Later, Sara brought me in to GMA, when she was the chef, to use my baking skills, for the first time, to make a Reine de Saba for Julia Child when she was the food correspondent on GMA. Sonia Selby Wright was the food segment producer at that time. After that, I would come in from time to time when Sara needed extra help for certain segments, and when she was on maternity leave I filled in for her. When she went to the food network she recommended I replace her as the Chef at GMA. 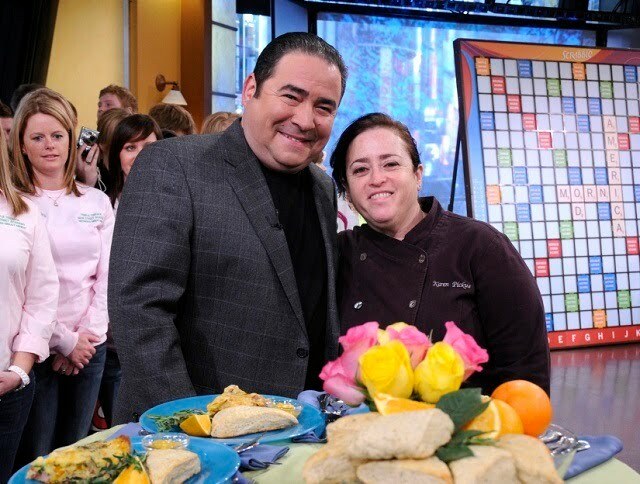 By that time Margo became the food segment producer and we have all worked together ever since. The rest is history. Steve, our friendly photographer taking this shot of the Salmon I made for Sara's demo for the GMA recipe website. I took these shots of Steve taking the salmon and then I shot the salmon I made for this blog! Eddie cuing Sara for a live shot. The Anchors, Ju Ju and Steve enjoying the food during the segment. After the show we went to Maialino for breakfast to celebrate and had these delicious ricotta crepes among other wonderful things! Drizzle the semolina bread with red wine vinegar. Top with lovely arugula leaves and piccio peppers. Top with ham and Genoa salami. Apple Gate Farm cured meats and cheeses.